BEL BORBA AQUI, filmmakers Burt Sun and André Costantini’s seminal cinematic discovery of Brazil’s most beloved and prolific artist, will play in Chicago at The Gene Siskel Film Center, 164 N. State Street, on January 19 and 21. See the Arts & Leisure feature story on the film, “Brazil’s Pied Piper of Street Art,” in The New York Times. 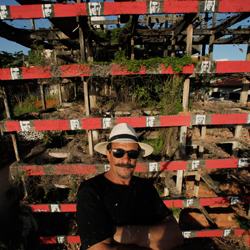 Known as “The People’s Picasso,” for 35 years Bel Borba has transformed the face of his hometown of Salvador de Bahia, Brazil – a historic city that is 500-years-old – with beautiful, grand scale and awe-inspiring art including sculpture, painting, murals and mosaic. Working with tiles, steel, sand, clay, and an eclectic mélange of recycled material including Coca Cola bottles and wood from Salvador’s famed Savaro boats, Borba’s ubiquitous public works reflect his feverishly ebullient personality and unbridled love of community. With an evocative Brazilian soundtrack and lush cinematography that exposes the lavish colors of Salvador, BEL BORBA AQUI explores the intense and intimate relationship between this unique city – a fusion of European, African, and Native Indian cultures – and her beloved native son. Also on view in Times Square this fall was the new, site-specific work Universal Pulsecreated by Bel Borba, along with acclaimed filmmakers Burt Sun and André Costantini. This presentation was a part of Times Square Moment: A Digital Gallery—the largest coordinated effort in history by the sign operators in Times Square to display synchronized, cutting-edge creative content at the same time every day. The piece was the first in the program’s history to be created specifically for use on the Times Square screens. BEL BORBA AQUI Brazil, 2012, 94 min. Written and directed by Burt Sun and André Costantini. Produced by Burt Sun. Executive Producer: Debra Winger. Co-producers: Michelle Sun and Mery Carla Monteiro Xavier. Director of photography: André Costantini. Camera: Csaba Sulyok and Burt Sun. Film Editors: Vanessa Reiser Shaw. Daniel Burity. André Costantini. Associate producer: Marco Gramacho and Guil Macedo. Music: André Costantini, Michael Wall, Eliano Braz, Darren Morze and Bob Hart. Sound: Richard Spooner. An Abramorama Release.